TORRANCE — Assemblymember Al Muratsuchi (D-Torrance) testified on Saturday at the South Coast Air Quality Management District (SCAQMD) hearing about his California Refinery Jobs and Safety Action Plan, which includes five Assembly bills that will improve public safety at all California refineries. The bills focus on phasing out the use of Modified Hydroflouric Acid (MHF), improving community alert systems and requiring air quality monitors around refineries, among other things. Refinery workers and concerned community members attended the fact-finding hearing held at the Torrance Marriott to discuss recent episodes of excessive flaring and increased pollution tied to repeated electrical outages and equipment breakdowns. Officials expressed deep concern over safety issues at the Torrance Oil Refinery, with attention focused primarily on the use of hydrofluoric acid. Only two California refineries — the one in Torrance and one in Wilmington — do not use a safer alternative to hydrofluoric acid, which forms a potentially lethal toxic cloud when released. Refinery managers say they use a modified form of the acid to make it safer, but industry critics and local activists have questioned whether it really is. Hydrofluoric acid is used in a refinery’s alkylation unit to manufacture high-octane grades of gasoline. 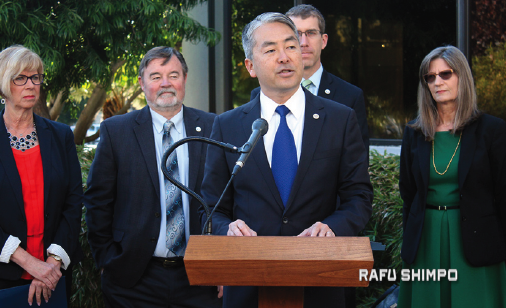 Muratsuchi, Hahn, Torrance Councilmembers Tim Goodrich and Kurt Weideman, and a representative for families lobbying against refinery exposure all voiced support for Muratsuchi’s package of bills. AQMD officials are expected to consider measures to improve safety and air quality at the refinery. The meeting comes on the heels of an EPA report that raised concerns about safety violations at the facility. Last fall, EPA inspectors found broken equipment that remained disabled for weeks even though its purpose is to help contain any accidental release of toxic hydrofluoric acid. The probe also found that the plant’s required risk management plan understated the danger to the community from a fire or chemical release because of several errors and inaccuracies, The Daily Breeze reported. On April 4, the Torrance City Council voted 5-2 against banning the use of hydrofluoric acid, but 7-0 in favor of pushing for improved safety measures. Goodrich has championed phasing out used of the acid at the refinery.